"Jim Thorpe Trophy" redirects here. For the college defensive back award, see Jim Thorpe Award. The National Football League Most Valuable Player Award (NFL MVP) is an award given by various entities to the American football player who is considered most valuable to his team in the National Football League (NFL). Selectors of the award have included the Associated Press (AP), the Newspaper Enterprise Association (NEA), Pro Football Writers of America (PFWA), and United Press International (UPI). The first award described as a most valuable player award was the Joe F. Carr Trophy, awarded by the NFL from 1938 to 1946. Today, the winner of the AP award is frequently said to be the NFL MVP. Since the 2011 season, the NFL has held the annual NFL Honors ceremony to recognize the winner of the Associated Press MVP award. The AP NFL MVP award is voted upon by sportswriters at the end of the regular season, before the playoffs, though the results are not announced to the public until the day before the Super Bowl. The award has been shared twice, in 1997 and 2003. Peyton Manning has won the award five times, the most of any player. In 2003, he shared the award with Steve McNair, of the Tennessee Titans. Manning is also the only player to win the MVP with more than one team (4 with the Colts, 1 with the Broncos). 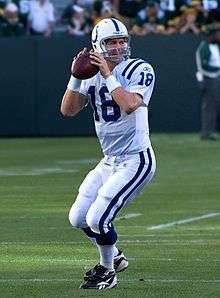 Jim Brown, Johnny Unitas, and Brett Favre were named MVP three times, while Joe Montana, Steve Young, Kurt Warner, Tom Brady, and Aaron Rodgers have each won the award twice. Favre is the only player to win the award three consecutive years, and Brady is the only player to ever be voted unanimously (2010). Most awardees have been quarterbacks and running backs; the only defensive players to be so honored have been Alan Page and Lawrence Taylor, and the only special teams player was Mark Moseley. On January 1, 2008, the AP stated that it awarded its first MVP in 1961. It is possible that this is a reaction to an article in Pro Football Weekly that suggests the AP's listing of its awards was incorrect. As recently as the morning (EST) of the same date, the AP's web site listed the 1957 MVP as Jim Brown, the 1958 MVP as Gino Marchetti, the 1959 MVP as Charlie Conerly, and the 1960 co-MVPs as Norm Van Brocklin and Joe Schmidt. The Pro Football Weekly.com article disputes the 1958, 1959, and 1960 winners. Since, as the PFW article points out, the AP began using the term "MVP" in 1961, it seems the pre-1960 winners are no longer considered "MVPs" but "Players of the Year." Adding to the confusion, the 1962 winner, Jim Taylor (in the story that moved across the AP wire in 1962) was the "Player of the Year", not the "Most Valuable Player." In 1963 the term "MVP" was used once again. According to another article by Pro Football Weekly, the terms "Player of the Year" and "Most Valuable Player" were interchangeable at the time. According to the 2014 NFL Record and Fact Book, the NFL "Most Outstanding Player Award" was given to Jim Brown in 1957 and 1958, Charley Conerly in 1959, and Norm Van Brocklin in 1960. In addition, Pro Football Journal showed that no AP story about NFL or AFL awards moved across the AP wires in 1960, thus there were no AP awards that season. Pro Football Writers of America began naming their most valuable player in 1975 and continue to do so as of the 2015 season. The Newspaper Enterprise Association presented its MVP award from 1955 to 2007. The winner was chosen by a poll of NFL players and received the Jim Thorpe Trophy, which by 1975 was described as "one of the pros' most coveted honors." Beginning in 1997, the trophy was presented by the Jim Thorpe Association, with the winner determined by a "vote of NFLPA representatives". The Joe F. Carr Trophy was first awarded in 1938, known then as the Gruen Trophy, and renamed in 1939 in honor of NFL commissioner Joseph Carr. The Gruen Trophy, sponsored by Gruen Watch Co., was first awarded in 1937 to Dutch Clark of the Detroit Lions. However, both contemporary and modern sources consider the 1938 award the first retroactive Joe F. Carr Trophy, and thus the first NFL MVP award. Players were chosen by a panel of sportswriters who distributed first and second place votes. It was awarded until the 1946 season, and remains the only MVP award the NFL has officially sanctioned. United Press International gave an NFL MVP/player of the year award from 1948 through 1969, excepting 1949–50, and 1952. In 1970 UPI instituted separate awards for the NFC and AFC. In 1975 UPI added a Defensive Player of the Year Award for both the NFC and AFC. "Joe F. Carr Trophy (MVP) Winners". Pro-Football-Reference.com. Sports Reference LLC. Retrieved June 15, 2016. "UPI NFL Most Valuable Player Winners". Pro-Football-Reference.com. Sports Reference LLC. Retrieved June 20, 2016. "Newspaper Ent. Assoc. NFL Most Valuable Player Winners". Pro-Football-Reference.com. Sports Reference LLC. Retrieved June 20, 2016. "AP NFL Most Valuable Player Winners". Pro-Football-Reference.com. Sports Reference LLC. Retrieved June 20, 2016. "PFWA NFL Most Valuable Player Winners". Pro-Football-Reference.com. Sports Reference LLC. Retrieved June 20, 2016. 1 2 Maske, Mark (February 6, 2016). "Cam Newton named NFL's MVP on eve of Super Bowl appearance". Washington Post. Retrieved June 22, 2016. 1 2 "Peyton Manning wins fifth NFL MVP award". Los Angeles Times. February 1, 2014. Retrieved June 22, 2016. ↑ Ducey, Kenny (February 7, 2016). "Cam Newton named NFL MVP". Sports Illustrated. Retrieved June 22, 2016. ↑ "NFL History: Awards". cbssports.com. CBS Sports. Retrieved June 22, 2016. ↑ "First-ever 'NFL Honors' show will be hosted by Baldwin in Indy". NFL.com. National Football League. January 3, 2012. Retrieved June 21, 2016. ↑ "National Football League MVPs". ESPN.com. The Disney Company. Associated Press. January 2, 2009. Retrieved January 4, 2009. ↑ Wilner, Barry (January 2, 2009). "Three-time MVP in NFL now a party for two". Pjstar.com: Peoria Journal Star website. GateHouse Media. Associated Press. Retrieved January 4, 2009. ↑ "NFL MVPs and Players of the Year 1948 to Present". Pro Football Journal. Retrieved February 6, 2016. ↑ "Brown Tops Unitas In Most Valuable Player Vote". Park City Daily News. Associated Press. January 12, 1959. p. 7. Retrieved June 24, 2016. ↑ "Noses Out Taylor; Hornung Most Valuable". The Milwaukee Sentinel. Associated Press. December 21, 1961. Retrieved June 27, 2016. ↑ Becker, Jim (December 13, 1963). "Tittle named most valuable". Kentucky New Era. Associated Press. p. 16. Retrieved June 27, 2016. ↑ "John Unitas Given Honor As Most Valuable Player". Sarasota Journal. Associated Press. December 11, 1964. p. 23. Retrieved June 27, 2016. ↑ "Johnny Unitas Wins Most Valuable Title". Ellensburg Daily Record. Associated Press. December 14, 1967. p. 5. Retrieved June 27, 2016. ↑ Beard, Gordon (December 19, 1968). "Morrall Most Valuable Player". The Evening News. Associated Press. p. 6D. Retrieved June 27, 2016. ↑ "Aaron Rodgers wins MVP in landslide". ESPN.com. ESPN. February 5, 2012. Retrieved June 22, 2016. ↑ Klemko, Robert (February 2, 2013). "Adrian Peterson overcomes knee injury to win NFL MVP". USA Today. Retrieved June 22, 2016. ↑ "Aaron Rodgers wins second MVP at NFL's annual awards program". Los Angeles Times. Associated Press. January 31, 2015. Retrieved June 22, 2016. ↑ Bieler, Des (January 20, 2016). "Pro Football Writers name Cam Newton their NFL MVP". Washington Post. Retrieved June 22, 2016. ↑ "PFWA NFL Most Valuable Player Winners". Pro-Football-Reference.com. Sports Reference LLC. Retrieved June 20, 2016. 1 2 "PFWA MVP winners". Pro-Football-Reference.com. Retrieved January 27, 2016. ↑ "Esiason named MVP by Writers Association". The Evening News. Associated Press. January 11, 1989. p. 2B. Retrieved September 24, 2016. ↑ Adams, Justin (January 15, 2014). Denver Broncos Peyton Manning named Pro Football Writers of America's MVP, Offensive Player of Year. TheDenverChannel.com. Archived February 3, 2014, at the Wayback Machine.Retrieved September 24, 2016. ↑ Mike Spofford (2015-01-14). "Green Bay Packers – Official Blog | Aaron Rodgers wins first league MVP award of 2014". Blog.packers.com. Retrieved January 27, 2016. ↑ "Newspaper Ent. Assoc. NFL Most Valuable Player Winners". Pro-Football-Reference.com. Sports Reference LLC. Retrieved June 20, 2016. 1 2 Olderman, Murray (December 16, 1960). "Van Brocklin Gets Jim Thorpe Trophy". The Telegraph. Newspaper Enterprise Association. p. 12. Retrieved June 21, 2016. ↑ "Harlon Hill Elected for Hall of Fame". Times Daily. October 26, 1975. p. 23. Retrieved June 21, 2016. ↑ Jim Thorpe Association Yearbook, 2007. ↑ Grainger, Charles (February 20, 1957). "Harlon Hill Due For Six Months' Army Service". The Tuscaloosa News. Associated Press. p. 9. Retrieved June 24, 2016. ↑ "Giants' Frank Gifford Named Top Star in NFL by Players". The Pittsburgh Press. December 20, 1956. p. 24. Retrieved June 24, 2016. ↑ Olderman, Murray (December 16, 1958). "Cleveland's Jimmy Brown Grabs Jim Thorpe Trophy". TimesDaily. Newspaper Enterprise Association. p. 7. Retrieved June 29, 2016. ↑ Olderman, Murray (December 20, 1959). "Giant Ace Wins Thorpe Title". Gadsden Times. Newspaper Enterprise Association. Retrieved June 29, 2016. ↑ Olderman, Murray (December 27, 1961). "Players Name Tittle Thorpe Trophy Winner". The Telegraph. Newspaper Enterprise Association. p. 12. Retrieved June 27, 2016. ↑ "Tittle and Brown Win Thorpe Trophy". The Fort Scott Tribune. Newspaper Enterprise Association. December 23, 1963. p. 11. Retrieved June 24, 2016. ↑ Olderman, Murray (December 18, 1964). "Thorpe Trophy Caps Len Moore's Comeback". The Pittsburgh Press. p. 36. Retrieved June 27, 2016. ↑ "Bob Griese Gets Thorpe Trophy As Top Player". Gettysburgh Times. Associated Press. January 5, 1972. p. 4. Retrieved June 21, 2016. ↑ "Jim Thorpe award goes to Tarkenton". Gadsden Times. Newspaper Enterprise Association. January 21, 1976. p. 30. Retrieved June 24, 2016. ↑ Archived July 16, 2009, at the Wayback Machine. ↑ Barry Wilner (2013-04-04). "Adrian Peterson Wins 2012 Offensive Player Of The Year Award". Huffingtonpost.com. Retrieved 2016-01-27. 1 2 "Mel Hein Voted Most Valuable". The Spokesman-Review. January 18, 1940. p. 13. Retrieved June 21, 2016. ↑ "Storck Named President". The Pittsburgh Press. July 23, 1939. p. 16. Retrieved June 21, 2016. 1 2 "Parker Hall Named Valuable Player". The Daily Times. January 18, 1940. p. 13. Retrieved June 21, 2016. 1 2 "Don Hutson Voted Most Valuable Pro". The Milwaukee Sentinel. Associated Press. February 12, 1942. p. 4. Retrieved June 13, 2016. 1 2 "Waterfield Named Most Valuable Gridiron Player". Prescott Evening Courier. Associated Press. January 4, 1946. p. 5. Retrieved June 21, 2016. ↑ "Joe F. Carr Trophy (MVP) Winners". Pro-Football-Reference.com. Sports Reference LLC. Retrieved June 15, 2016. ↑ Turney, John (February 21, 2015). "Dutch Clark's Missing 1937 MVP Award". nflfootballjournal.com. Pro Football Journal. Retrieved June 21, 2016. ↑ "Ace Parker, Brooklyn, Voted 'Most Valuable'". The Milwaukee Journal. Associated Press. January 18, 1941. p. 7. Retrieved June 22, 2016. ↑ "Don Hutson Named Most Valuable Pro". The Milwaukee Journal. United Press. January 28, 1943. p. 10. Retrieved June 14, 2016. ↑ "Sid Luckman Gets Grid Trophy". Daytona Beach Morning Journal. September 2, 1944. p. 3. Retrieved June 22, 2016. ↑ "Sinkwich Voted Most Valuable". Pittsburgh Post-Gazette. Associated Press. April 3, 1945. p. 15. Retrieved June 22, 2016. ↑ "Bill Dudley Gets Trophy Sunday". The Pittsburgh Press. United Press. October 9, 1947. p. 40. Retrieved June 22, 2016. ↑ Total Football II: The Official Encyclopedia of the National Football League. Bob Carroll. HarperCollins Publishers. ISBN 9780062701749 pg. 389. ↑ "Connerly Named Prize Rookie; Harder Honored". The Tuscaloosa News. United Press. December 15, 1948. p. 13. Retrieved June 22, 2016. ↑ "Graham Picked As Top Player In Pro League". Spokane Daily Chronicle. United Press. December 23, 1953. p. 11. Retrieved October 6, 2016. ↑ "Perry Top Pro Gridman of '54". The Bend Bulletin. United Press. December 22, 1954. p. 3. Retrieved October 8, 2016. ↑ "Tittle, Francis Feted at Million Dollar Dinner". The Bulletin. United Press. January 29, 1958. p. 3. Retrieved August 15, 2016. ↑ Archived August 21, 2009, at the Wayback Machine.